Vero-toxigenic Escherichia coli infections are the cause of oedema disease, which is usually seen in groups of pigs 7 to 14 days after weaning. The pigs often develop nervous signs including uncoordinated ataxia, recumbency and convulsions. 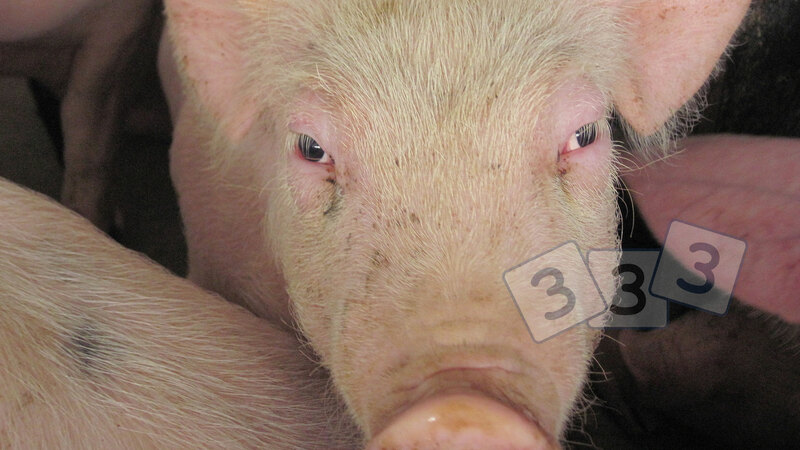 Many of the sick pigs also have marked soft tissue swelling (oedema) of the upper and lower eyelids. Some affected pigs can also have an amazing change in their normal vocalisation sounds, from the usual strong squealing sound, into a high-pitch squeaky voice. At autopsy, the soft gelatinous oedema is evident in the eyelids, but also in the area of the colon, the wall of the stomach and the larynx. The causative E coli bacteria are located in the nursery farm environment and are ingested by the piglet soon after weaning. The bacteria then attach to the small intestine and their vero-toxins cause blood vessel disturbances in the brain and these other locations in the pig. It is therefore important to note that the intestines of the pigs must be sampled to culture the correct strain of E coli. The reduction of usage of zinc oxide feed additive away from appropriate anti-E coli pharmaceutical levels has led to increased outbreaks in some locations.